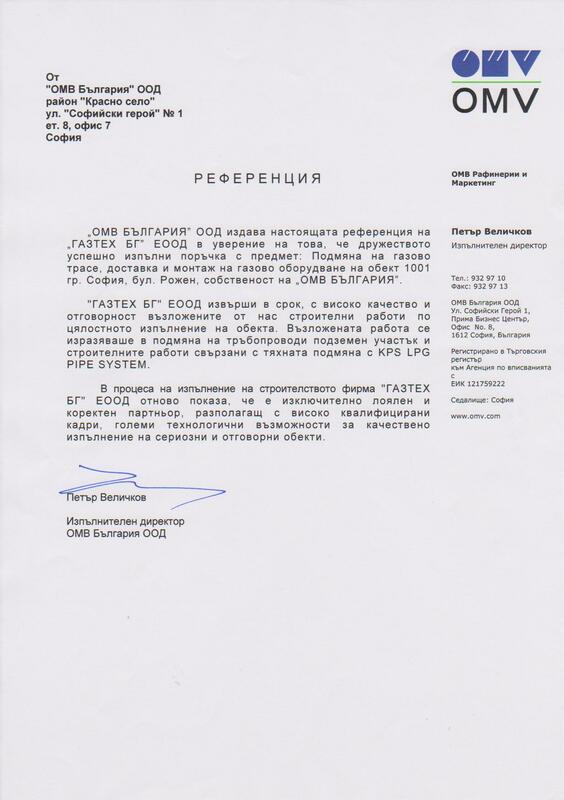 OMV BULGARIA Ltd. issued this reference to GASTEH BG Ltd. to certify that the company successfully implemented the order with subject: Replacing gas route, delivery and installation of gas equipment for object 1001 Sofia, Blvd. Rozhen, owned to OMV BULGARIA Ltd.
GASTEH BG Ltd. completed on time, with high quality and responsibility the assigned of us construction works on the overall implementation of the site. Assigned work was expressed in the replacement of pipelines and underground lot and construction works related to their replacement with KPS LPG PIPE SYSTEM.